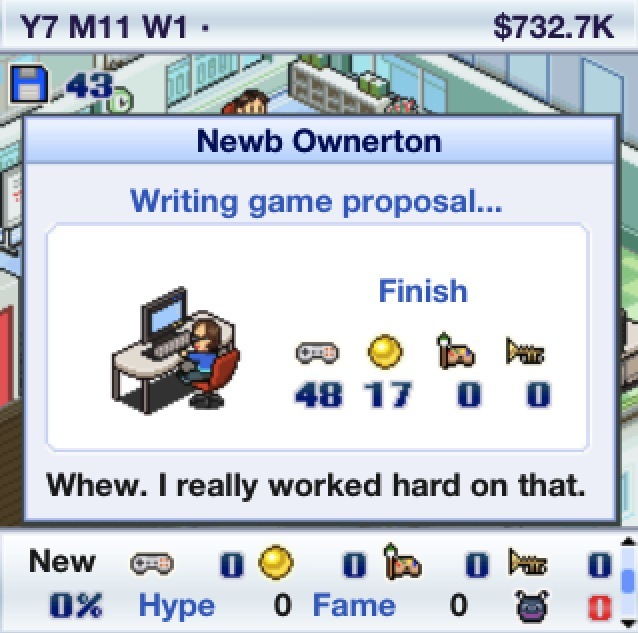 As Toucharcade reported, Game Dev Story [iTunes-Link] dropped to 99¢ (maybe it will be back to 2.99¢, but chances are it will drop again). It’s a good moment for a few hints. 1. The game tells you what to do. Your secretary guides you through the game. At the right time, the game displays additional hints that let you figure out what to do. So if you want to discover the game on your own – it’s perfectly possible. Usually, the more money you spend (on staff, on advertisement, on a license etc. ), the more money you can make afterwards. Even right at the beginning it’s clever not to go with the cheapest option. Use »train« and »level up« frequently – it not only improves the skill of your workers but also their power. And it helps you unlock new types and genres of games you can develop. Also »hire« new staff, when you can afford it. Right after you move to the largest office (8 staff members), you should spend $3.5M for the Hollywood Agent and try to hire some hackers with high skills. It’s usually the best option to change what you are doing. 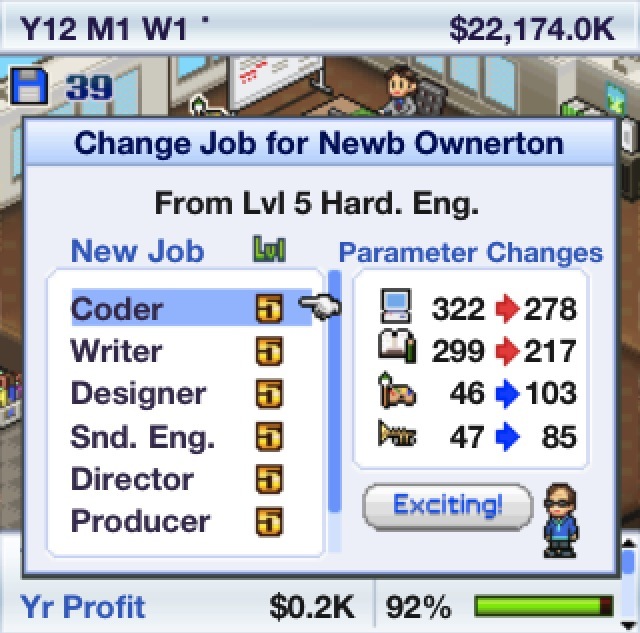 Develop a new type of game, work on a contract after a game, don’t use the same staff member twice for the same job etc. Not all of them are available from the start. As far as I can tell, the job description has no influence on the way staff members do their job. However, you can change the job title using the »Career Change Manual« the traveling salesman sells you. 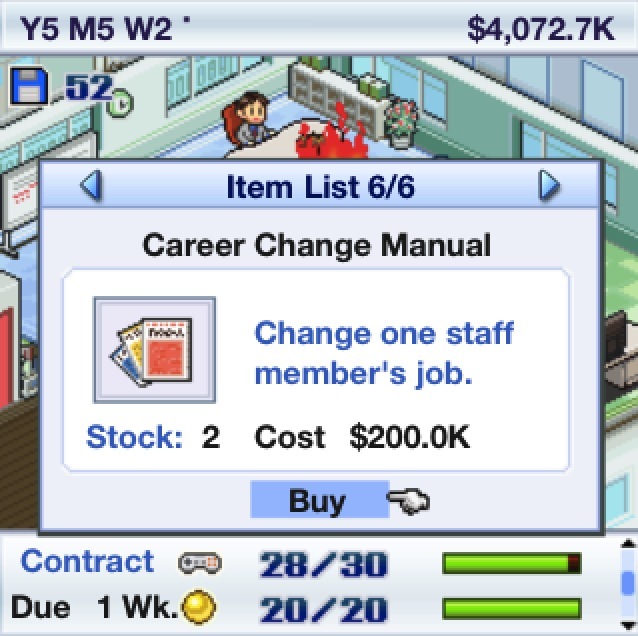 This will affect most of their skills, but it will allow you to level up your staff member from level 1 again. 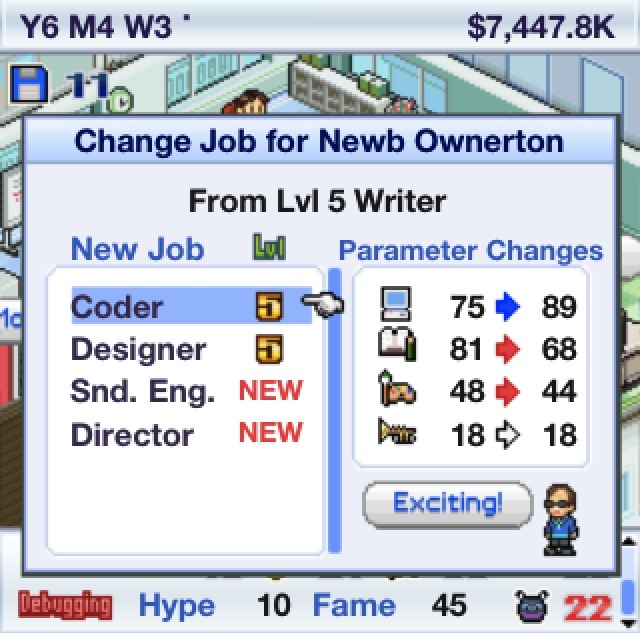 So basically you can level up a coder, change his job description, level him up as a designer and so on. 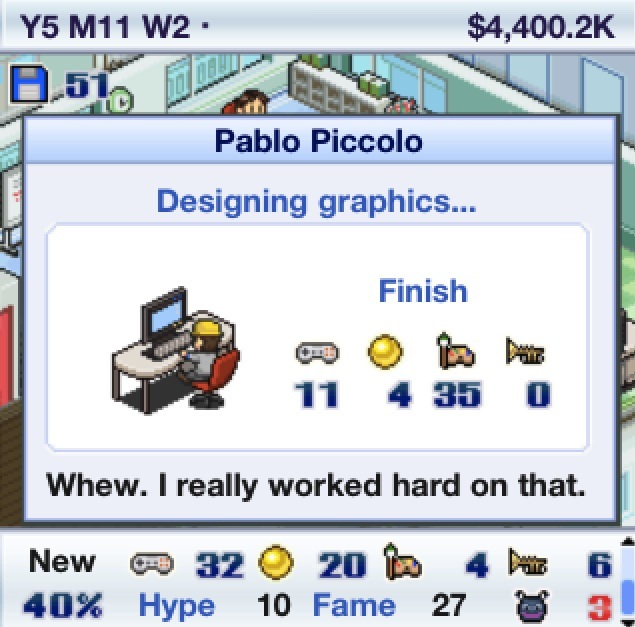 This let’s you create very high skilled team members (with very high salaries). After you leveled up one team member in all job titles, Hardware Engineer becomes available. You will need a Hardware Engineer to develop your own console. Hackers can only be hired but not trained. As said above, often times you have to spend a large part of your cash as an investment. Don’t hesitate to do so – but never spend all of your money. The salesman might come by, you might to have to pay salary or invest in advertisement. Also reserve some cash to pay for external experts on game development. Buying new licences is important. It requires a certain timing skill. Always use one main licence on which you develop your games. In my opinion it’s not useful to develop on two consoles at the same time. But once your console becomes old or loses market share you should consider a change (and save up the money to buy the licence). Game scenario. Works just like design and audio: Pick a staff member or an outside expert with a high skill in the relevant aspect. Use staff members that haven’t worked the same job before (the games let’s you know who you picked last) and don’t use staff members with low power. Boosts. 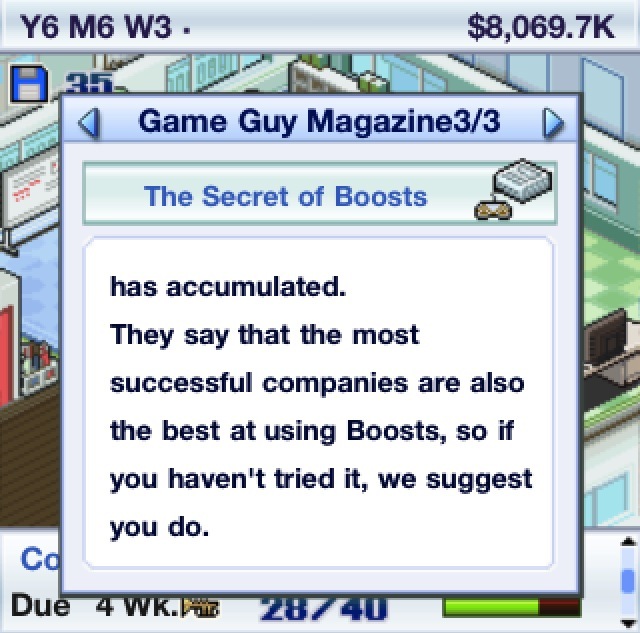 Boosts come in two types: Either you can pick a certain boost with a boost item purchased from the salesman (e.g. »Fun Boost«). 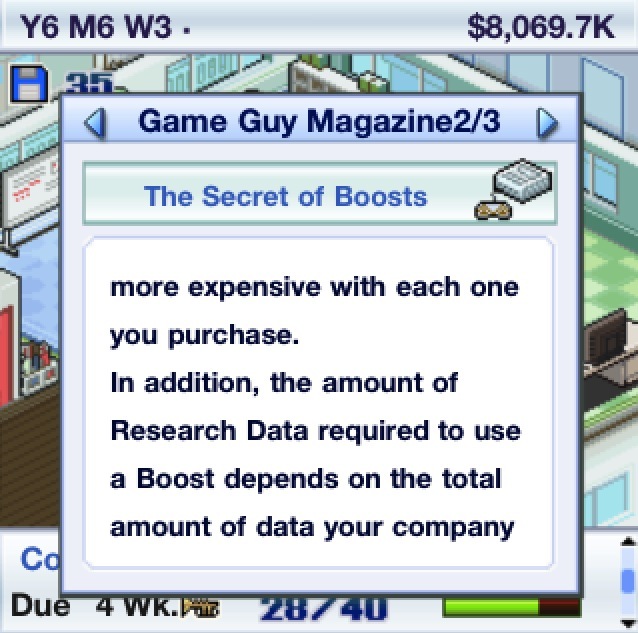 You use 30 research data but no cash and can boost one aspect of your game by about 10 to 30 points, depending on who you pick; or staff members walk up to you and ask for your permission to boost one aspect on their own. 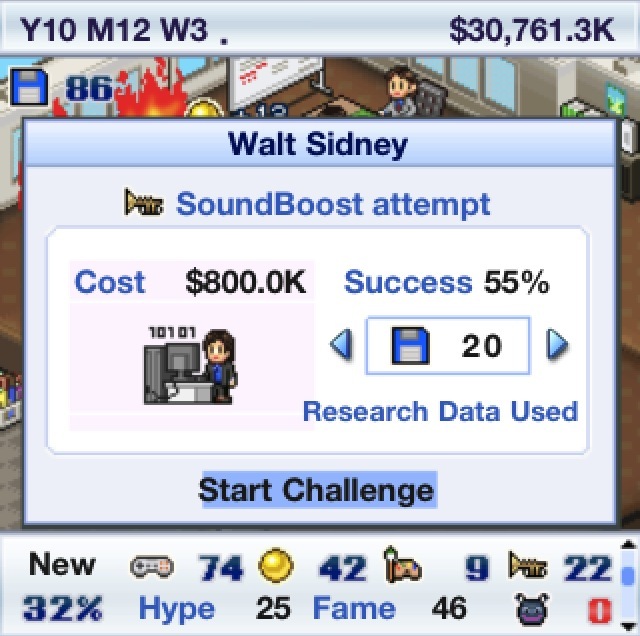 This costs money and depending on the skill level of the employee a certain amount of research points. 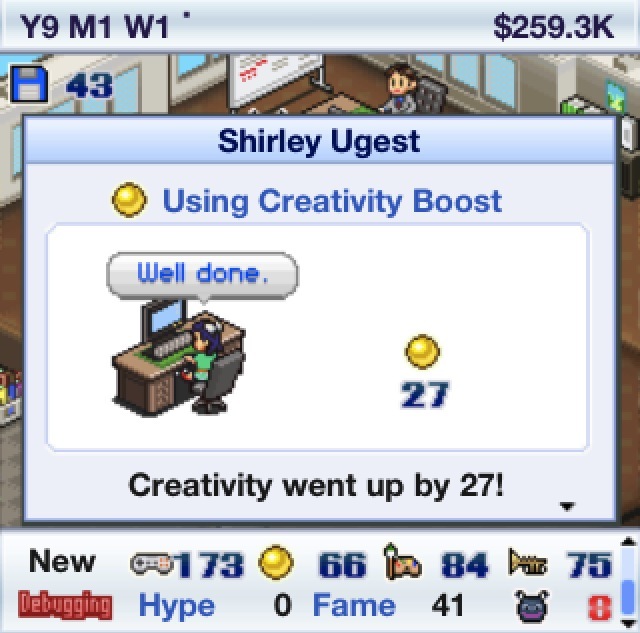 In my opinion you should use the second type of boost only after you employ hackers or other employees with skills above 100. Bugs. Bugs are basically just a delay. I always wait for all the bugs to found – during this process you also get quite a few research points, so it’s not wasted time. It’s pretty straight-forward, once you have a hardware engineer. For a decent console you need $92M. in cash (there are cheaper options). I haven’t actually completed any of these yet – that’s why they are called challenges. As this forum member posts, you can upgrade hackers in all other jobs they will reach skill levels above 600. This challenge is also explained in a forum thread. Starting quick for high scores. Start real slow. 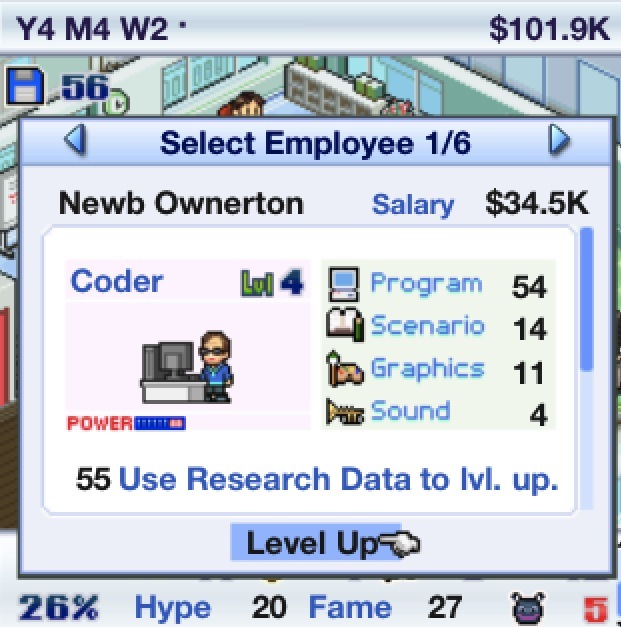 Don’t spend any money/research on training/levelling-up employees, they will not remain employed long. Develop only for the PC until either you have a lots of cash or the GameBoy comes out. Fill all the positions with cheap hires from word-of-mouth ASAP, then once or twice a year do a more expensive search and get people with high stamina and decent stats. Produce a wide variety of games. Getting a type to level two gives direction points, so in the beginning try and get as many of these instead of specialising in a couple of types. Whenever someone asks if they can try and improve an area of a game, say yes but only spend a single research point on it. If they succeed that’s good, but if they fail it will create bugs which convert to research points. It’s win-win. If you can afford it, set your games to emphasise research. Whenever the salesman comes, buy three career change books only. Within a couple of years you should be able to accumulate a few hundred research points. As soon as you find Mister X, (or another promising employee with excellent stamina,) get him and level him up as much as you can, then use the career change book and level him up to 5 again, this will unlock lots of new genres. When you get him to level 5 in a certain career, do some training and you should unlock a heap of new types as well. He starts with low stats, but with so much levelling and training you may find he becomes your best worker. When you are offered the new office, again fill it with cheap hires, and replace them with better people later to avoid steep contract costs. Do your expensive hiring in month four so that you don’t have to pay as much in salary each year. After playing the game twice, there are still some questions unanswered. 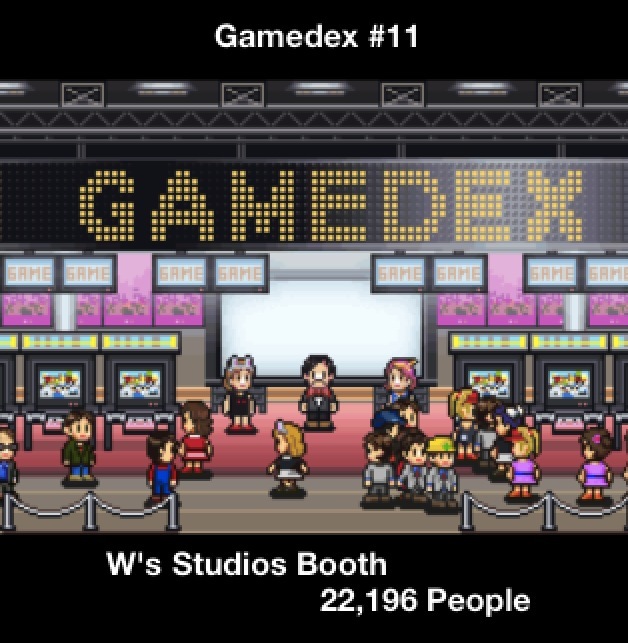 What is the exact point of the Gamedex exposition? It certainly affects sales – but how? Moving Seats. You can do that – does it have an effect? Ask any question you might have in the comment field. Further reading: Article in Wired. this is a real helpful post! The Gamedex to me only seems helpful in the first years you are able to go there as your fanbase might increase following to the event. But that only seems to happen if your fanbase is „small enough“. Thanks for your reply. I’ve played the game some more and will need to improve my post (I have also noticed the hacker mistake)… Will do that soon. Do you know when you get to upgrade office? I know you upgrade twice but it is triggered by time or number of games released or something? But thanks for the post, some excellent tips. Great guide, following it now! As it seems most posts say you cannot directly hire a hardware engineer, you need to level one employee through all roles I thought I’d make a note to say you *can* hire a hardware engineer!!! I was on my second play-through, year 19. Recruited with Hollywood agent, Chimpan Z-Force, it’s a monkey :P Lvl 1 Hardware engineer. Some good combinations that seem to work well is anything that is kinda sexual. Motion + Swimsuit and Motion + Junior High seem to work pretty well. As for moving seats, here is the thing – points don’t go up if your employees are not at their keyboards working. The futher they have to walk to confer with each other, the less they are coding. I tend to do the following – set your hackers toward the door. Set your coders near your hackers. Then set your producer, director on the far side, next to each other, then your writer near them, their back facing the hacker. Position your designer and sound engineer in the other two seats (or other employees, whatever their level). This seems to create the least amount of walking, and having your employees at their keybaord more. Do you know how to unlock the special consoles? I have done it twice, but cannot seem to get down what unlocks it. The Game John I have only unlocked once. Also, do you know how to get Kairobot? I got him on staff once, but have not been able to get him again since. This is a great guide. Thanks alot! I have a glitch that there is 2 wrestling types. They are both pop. C but one cost $25.0k and the other one is $28.0k. gamedex affects only if you have curretnly a gam on sales. The beste timing is to have a game effectively on sale one week prior to gamedex (please note the realeased game will be on sale the next full week). This will boost your sales up to 20% depending on the time when gamedex takes place duren the sales peirod. 20% is just an estimate on what I have experienced. ANd thx btw the guide is very good! Is a good idea to make all staff a hackers? How do you raise enough money if your staff are all low level? You need to level them up to at least LVL3. Does „Direction of current game“ ultimately matter for specific genre/types? Actually it might be a really *bad* thing to let an employee fail at increasing a game’s property. 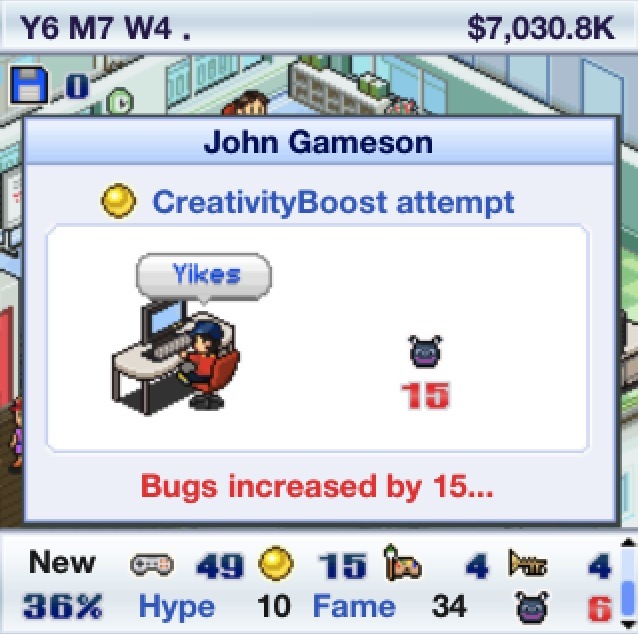 Not only do you get 20+ bugs, but you lose 15+ Hype, which has a severe effect on sales. Additionally, succeeding at the challenge not only gets you 25+ points on the property in question it also gives you 15+ Hype, which is an additional boost to sales numbers. So be careful here. If you’ve got no hype in the first place, you really have nothing to lose, but if you’re working on a game combination that has a hype boost out the gate you might want to make sure you actually succeed the boost challenge. You can Train Hardware Eng. or Hacker. 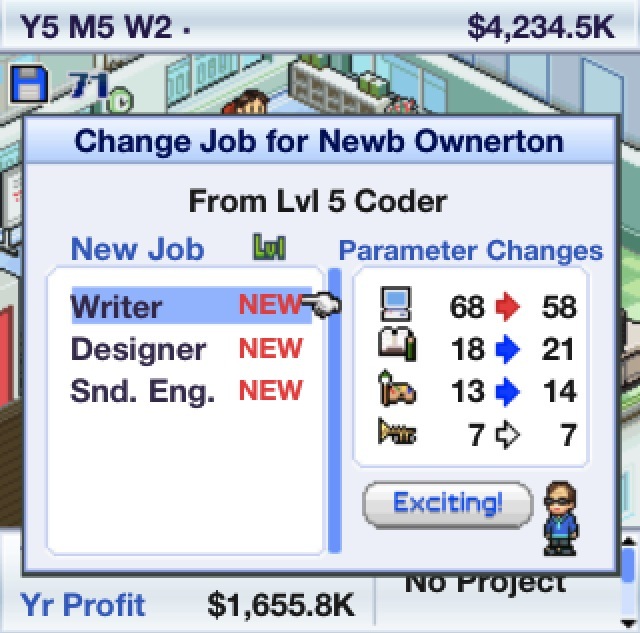 Director lvl.5 & Producer lvl.5 → Available to change job to Hardware Eng. Director lvl.5 & Producer lvl.5 & Hardware Eng. lvl. 5 → Available to change job to Hacker. You can also Hire Hardware Eng. or Hacker. After Winning GOTY 3 times, you can hire Chimpan Z-force (Hardware Eng. lvl. 1) at Hollywood Agent. 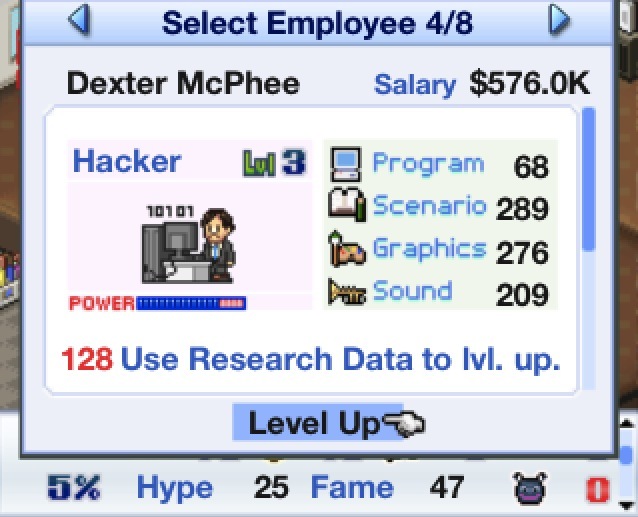 You can hire total 4 Hackers at Hollywood Agent (Kairobot will unlock after 5 GOTY winning). Hi guys, is there a way to transfer data from the lite version to the full version? Green Weight Loss Pills That Work pills aid in losing weight. 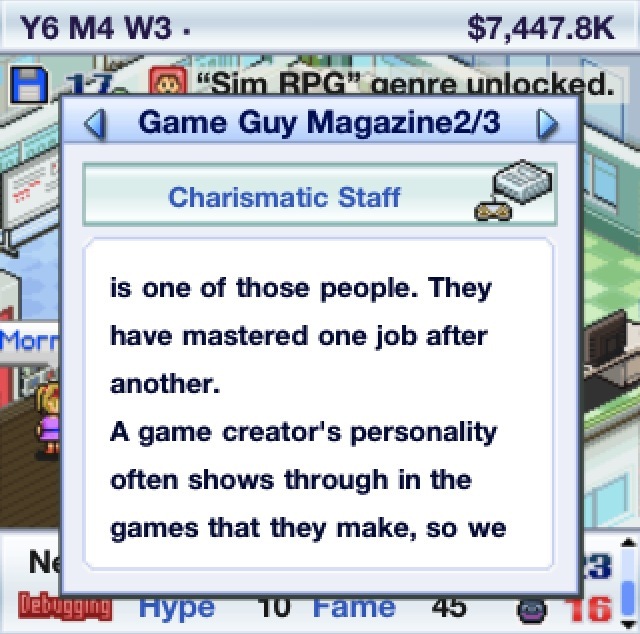 We worried that it was only us who were obsessed by the cute Japanese game, which puts you in charge of your own games developer. However, it seems there are plenty of others bitten by the bug. First, you’ll need to hire some employees. 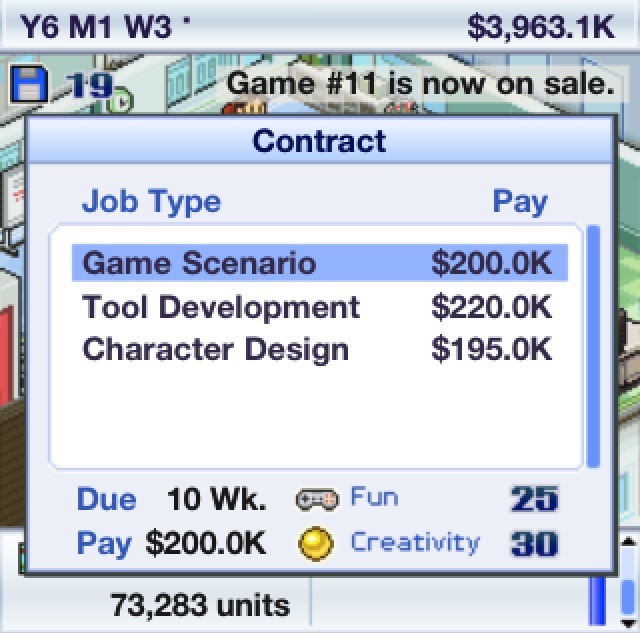 You can start developing a game to earn money, or take contracting jobs and focus on training your staff. The upper left floppy disk shows your Research Data. 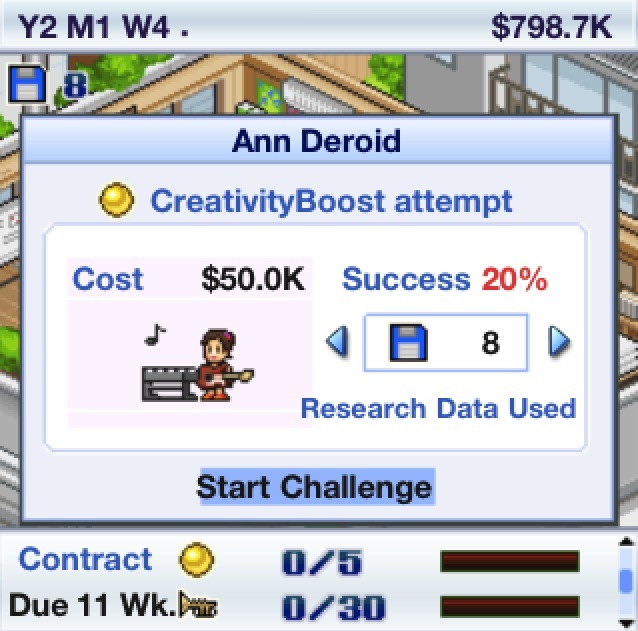 Earn more by developing and debugging games. This allows you to level up staff and use boosts. If you do a contracted job well, you will get money and Research Data. It’s hard to make a lot of money this way, but it doesn’t require any capital. First, you have to select a game genre and type. The combination of these will have a big effect on sales. You will need a license to develop for a game console. 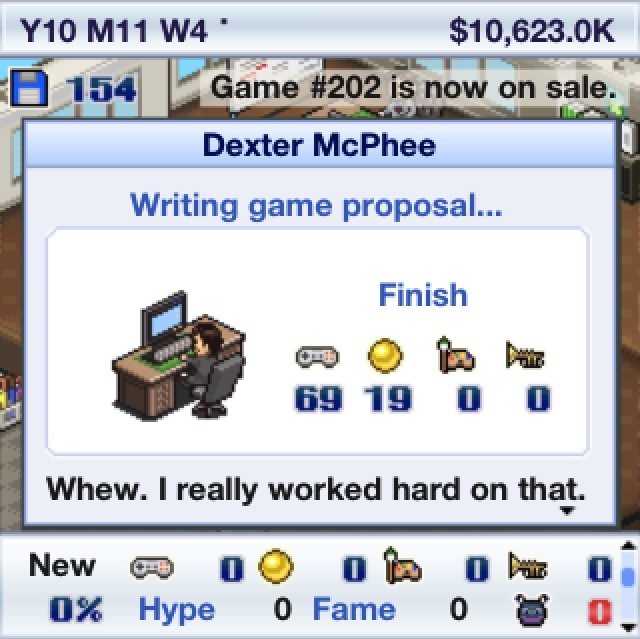 Next, you need a game proposal. You can ask an employee with scenario writing experience, or outsource it. Your choice affects the game’s quality. During development, you’ll also have to add graphics and sound. You can use your own staff or outsource these, but using someone too often will tire them out. Me and my brother play the game. He got option to hire kariobot, I did not. How can u unlock the option to hire Kariobot?